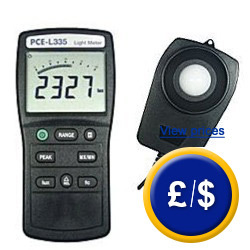 The PCE-L335 Lux Meter is attractive due to its wide measurement range from 0 to 400,000 lux. Furthermore, this lux meter has a large LCD which also shows graphic bars for easy reading The lux meter is registered according to standard CNS 5199 class II. 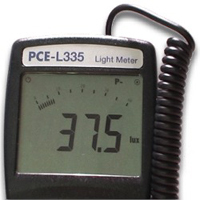 Operating conditions 0 to 50°C/< 80% r.h.
View of the PCE-L335 Lux Meter display taking a measurement in lux units.